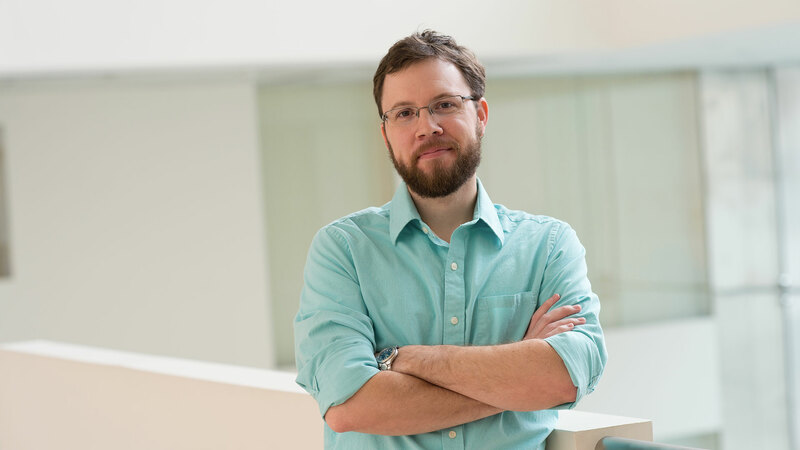 Mark Harnett studies how mammalian neurons process information and perform the complex computations that underlie behavior. 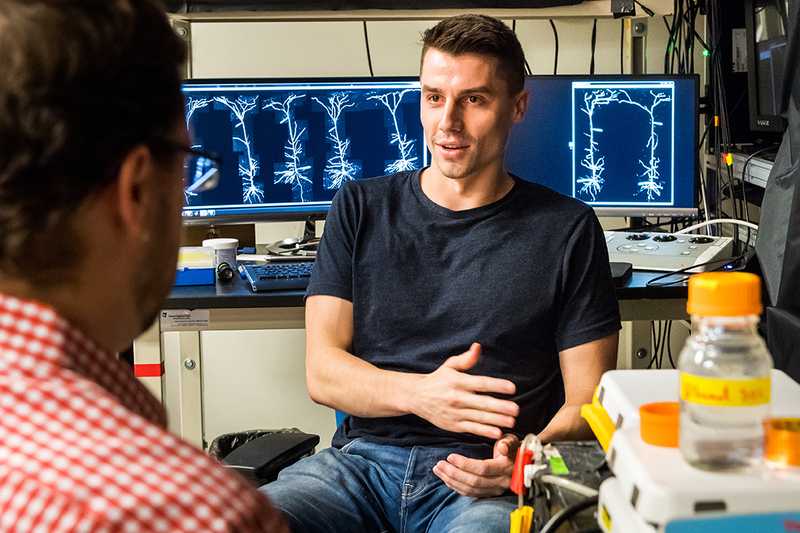 Mark Harnett studies how the biophysical features of individual neurons, including ion channels, receptors, and membrane electrical properties, endow neural circuits with the ability to process information and perform the complex computations that underlie behavior. As part of this work, the Harnett lab was the first to describe the physiological properties of human dendrites, the elaborate tree-like structures through which neurons receive the vast majority of their synaptic inputs. Harnett also examines how computations are instantiated in neural circuits to produce complex behaviors such as spatial navigation. 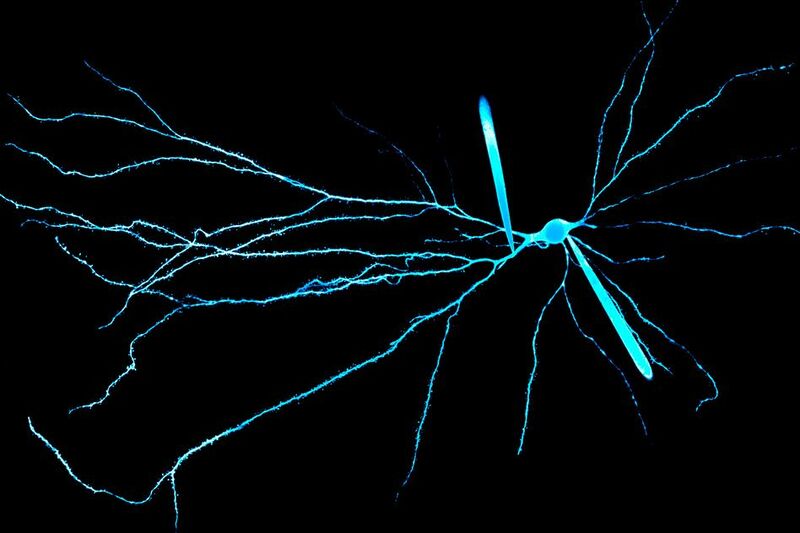 The laboratory focuses on the role of dendrites, the elaborate structures through which neurons receive the vast majority of their synaptic inputs. The thousands of inputs a single cell receives can interact in complex ways that depend on their spatial arrangement and on the biophysical properties of their respective dendrites. For example, operations such as coincidence detection, pattern recognition, input comparison, and simple logical functions can be carried out locally within and across individual branches of a dendritic tree. Harnett addresses the hypothesis that the brain leverages these fundamental integrative operations within dendrites to increase the processing power and efficiency of neural computation. He focuses in particular on sensory processing and spatial navigation, with the goal of understanding the mechanistic basis of these brain functions. To address how biophysical mechanisms influence circuit-level computation, the Harnett lab combines 2-photon imaging and electrophysiological recording techniques with novel rodent behavioral paradigms to measure the activity of neuronal populations as well as subcellular compartments. This allows evaluation of dendritic mechanisms as a function of circuit dynamics during complex behaviors. Mark Harnett joined the McGovern Institute in 2015 and is currently the Fred and Carole Middleton Career Development Professor in the Department of Brain and Cognitive Sciences. He received his BA in Biology from Reed College in Portland, Oregon and his PhD in Neuroscience from the University of Texas at Austin. Prior to joining MIT, he was a postdoctoral researcher at the Howard Hughes Medical Institute’s Janelia Research Campus where he worked with Jeff Magee. Enhanced dendritic compartmentalization in human cortical neurons. ​Beaulieu-Laroche, L., Toloza, E.H.S., van der Goes, M.S., Lafourcade, M., Barnagian, D., Williams, Z.M., Eskandar, E.N., Frosch, M.P., Cash, S.S., Harnett, M.T. (2018). Cell 175, 643-651. Dendritic spines prevent synaptic voltage clamp. ​Beaulieu-Laroche, L., Harnett, M.T. (2018). Neuron 97, 75-82. Synaptic amplification by dendritic spines enhances input cooperativity. Harnett, M.T., Makara, J.K., Spruston, N., Kath, W.L., Magee, J.C. (2012). Nature 491, 599-602. Ranganathan, GN, Apostolides, PF, Harnett, MT, Xu, NL, Druckmann, S, Magee, JC et al.. Active dendritic integration and mixed neocortical network representations during an adaptive sensing behavior. Nat. Neurosci. 2018;21 (11):1583-1590. doi: 10.1038/s41593-018-0254-6. PubMed PMID:30349100 PubMed Central PMC6203624. Beaulieu-Laroche, L, Toloza, EHS, van der Goes, MS, Lafourcade, M, Barnagian, D, Williams, ZM et al.. Enhanced Dendritic Compartmentalization in Human Cortical Neurons. Cell. 2018;175 (3):643-651.e14. doi: 10.1016/j.cell.2018.08.045. PubMed PMID:30340039 PubMed Central PMC6197488. Beaulieu-Laroche, L, Harnett, MT. Dendritic Spines Prevent Synaptic Voltage Clamp. Neuron. 2018;97 (1):75-82.e3. doi: 10.1016/j.neuron.2017.11.016. PubMed PMID:29249288 .